without the need for additional software. The intelligent parallel gripper SCHUNK EGI with certified PROFINET-IRT interface was particularly designed for demanding and diverse handling tasks in electronics, pharmaceutical and laboratory applications. With its individually programmable stroke of up to 57.5 mm per jaw, and a flexibly adjustable gripping forces up to 100 N, the robustly designed and sturdy mechatronic gripper can handle an enormous range of workpieces. Due to its integrated intelligence, even components that are flexible or sensitive to deformation or fracture can be handled gently and reliably. That makes commissioning extremely easy. A specially developed, active gripping force maintenance of the SCHUNK EGI ensures that the built-up gripping force is almost completely maintained, even in the event of a power failure or emergency stop – a clear advantage as compared to conventional mechatronic grippers on the market. In contrast to grippers with conventional gripping force maintenance via springs, the overrun traverse of the gripper finger in the locked state is minimal. This means that the SCHUNK EGI makes an important contribution to the prevention of accidents caused by flying parts or trapping. 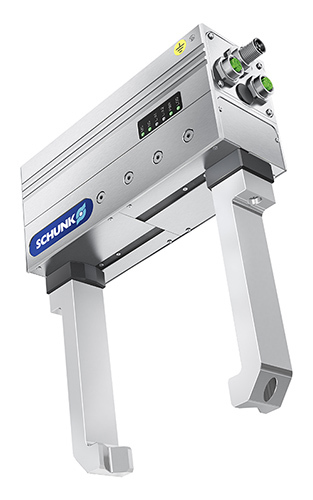 With its integrated web server, active brake, and certified PROFINET interface (category C), the SCHUNK EGI is one of the most convenient mechatronic grippers on the market. An extensive range of functions matched with simple commissioning: A standard integrated web server can be used to configure all of the basic functions without the need for additional software. Added features increase the level of convenience: The jaw movement can be manually controlled on the gripper in crawling mode, which offers advantages such as after an emergency stop. The “extended referencing” function can also be used to store one individual maximum stroke and to set it as an exact limit on the software side, helping to simplify the programming. With its certified, IRT-compatible PROFINET interface (category C), the SCHUNK EGI meets all the requirements for high-performance applications. The position of the gripper finger, the gripping forces, and the closing speed can be detected and controlled with virtually no delay. Intermediate positions and special referencing for the gripper are also possible. The first step is standardizing the intelligent gripper for small components in size 80. Plans have already been made for including additional sizes. Moreover, the functional scope should be further expanded via software updates.